5 leaves : ; 28 cm. Agricultural production in the Koutiala region, southern Mali, is based on cash sources (cotton and groundnut), cereal sources (maize, sorghum, millet), and a store of wealth (livestock). In these low-input farming systems, crop production is seriously constrained by soil fertility decline. Research is being conducted in the region to investigate the potential of improved fallows planted to leguminous agroforestry tree species to improve soil fertility and crop production. This study examines the potential for adoption of this technology. 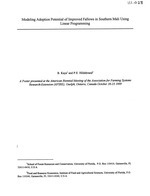 Includes bibliographical references (leaf 5). B. Kaya and P.E. Hildebrand. "A poster presented at the American Biennial Meeting of the Association of Farming Systems Research-Extension (AFSRE), Guelph, Ontario, Canada, October 20-23, 1999." 2Food and Resource Economics, Institute of Food and Agricultural Sciences, University of Florida, P.O. Box 110240, Gainesville, FL 32611-0240, U.S.A.
(cotton and groundnut), cereal sources (maize, sorghum, millet), and a store of wealth (livestock). loan program, similar to the one that cotton enjoys, would make the venture viable. area or even abandoned in many farming systems. the region using linear programming for a "Type A" household. has resulted in a dramatic soil fertility decline and severe water erosion problems. through high quality fodder production. 2000 kg of DM for three months. at the same time, reduces by half the monetary value of fodder. Total subsidy of the installation cost and no monetary value for fodder. because of the change in the price of fodder. required fodder, freeing more time and land for other activities. similar to the one that cotton enjoys, would make the venture viable and attractive to farmers. fertility constraints to crop production. Fertilizer Research 29:117-125.
production in the sudanian region of Mali. Agricultural System 54(4):489-503.
methodologie du "Volet Fonsebougou" (1977-1987), Systemes de production rurale au Mali. Volume 1, IER/Bamako/Mali, KIT/Amsterdam, Pays-Bas. maize yield. For. Ecol. Man. 64:199-208.
pruning quality and methods of application. Agroforestry Systems 35:31-46.
highland microregions of Kenya. Agroforestry Systems 35: 187-201.
considerations. Agroforestry Systems 19: 207-216.
as affected by their lignin and polyphenolic contents. SoilBiol. andBiohem. 23:83-88.